I have been playing around in Elder Scrolls V: Skyrim again. Furthermore I have been on Youtube watching other people playing Skyrim. One thing I think Elder Scrolls as a series has highlighted well is traps. If you don’t pay attention you are going to get hit by a trap. Bear traps, pitfalls, booby trap chests, swinging spike walls, battering rams, poison darts, oil fires, and pendulum hallways are all present. 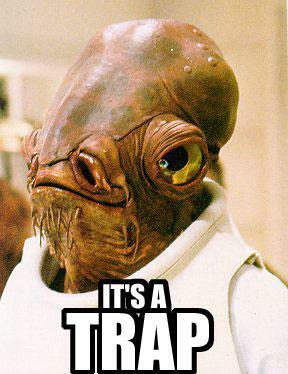 But I also realized that traps in Skyrim, as with traps in most RPGs are not often lethal. Even getting caught in a bear trap doesn’t immobilize the character. So what is the point of a trap if it is not going to kill the victim? I don’t see much of a reason at all. In table top games traps are often used to whittle at PCs. Especially in 4th edition D&D, assuming you still have healing surges to spend a trap isn’t particularly dangerous. If you want to include traps in your game I can see only four common implementations. The trap must possess the potential to kill someone. Head over to the Dungeon Masters Guide (pg 87). The False-Floor Pit. The pit trap is one of the oldest tricks in the book. The trap itself only does 1d10 damage. It is in no way lethal by itself. However, upgraded to Elite the pit is deeper and is filled with poison spikes. As an elite trap it deals 3d10 and ongoing 5 poison damage (save ends). This can absolutely be lethal for low level characters, even if the initial fall isn’t a death blow. The trap must be implemented by creatures for their benefit. As stated traps by themselves are rarely lethal and more so considering they can usually be disabled or avoided with relative simplicity. One of my personal favorites is the Magic Crossbow Turret. A level three trap it deals good damage, does not fire on native monsters and each trap consists of two turrets. That’s two traps for the price of one. The best implementation I have seen is a room with a gaggle of minions with one or two true monsters and this trap placed high up in the room. PCs have to make a decision to not kill monsters and climb up to disable the turrets. If left alone this trap will reduce a party to corpses in no time. If you want to be particularly sinister put something in the room like a chest to tempt them to overstay in the turret’s cross hairs. Also consider using things like bear traps and pit falls. Place large, burly brutes in the encounter. Use your brutes to push PCs into the pits. Being placed in a pit essentially removes a PC from combat for a round in addition to damaging them. This is a great way to push around healing and ranged classes and putting them in a position where they no longer have line of sight. For bear traps make the traps do a small amount of damage but also restrain the victim until they can make a check to free themselves. These are great traps to use with monsters like Lurkers that thrive on combat advantage. Throw a pair of Bugbear Stranglers into the mix (MM1, pg 136) and have the PC spend its entire turn attempting to escape the bugbear’s garrote grab and the bear trap. The trap must have some significant, ongoing effect. Most traps as designed will not outright slay a PC. That is not to say you cannot have the odd, lone trap in the dungeon but its impact should be significant, be crafty. Kobolds are known for traps, it’s what allows the small creatures to combat dumb, more powerful monsters. Consider a trap that dumps hot oil or tar on the PCs. Sure they will take some damage, but the significance is in the next encounter. Add some Kobold Slingers (MM1, pg 168) to the next encounter with firepots. Hit a PC or two covered with flammable oil/tar and watch them turn into living torches. As a bonus the smart party with a wizard can easily prestidigitate the oil/tar off the party. Reward your wizard for playing smart. For a further example check out the Poisoned Dart Wall (DMG, 89). By itself the trap is not lethal and does not recognize friend from foe in a fight. I suggest removing the ongoing poison damage and fitting it with the 4e disease framework. Diseases are one thing most people can agree 4th edition did correct. Unfortunately they are not used very often. The framework is great for applying, lasting effects to PCs as they are only afforded one save per day. Failing the save by a certain margin means the effect gets worse. Consider replacing the Dart Wall’s poison with Filth Fever (MM1, pg 219). The loss of a healing surge is nothing but fail the first save and suddenly the PC has a -2 penalty to all defenses. Fail the next saving throw and the target has a -2 to all defenses, loses healing surges and cannot regain hit points. Drop something like this in the middle of a dungeon and things can turn dire quickly for some of the party. The Dart Wall’s ‘poison’ will stick with them for a while. Some will get better and some may get worse. I have run games where PCs go to the final stage of diseases it really pumps of the danger factor. The trap’s activation must impede the victims from something. Sometimes a trap does not have to directly affect PCs for it to be a significant obstacle. This is the most difficult to implement in a game as it takes more planning on the DM/GM’s part. Sometimes a trap just needs to keep the PCs from something. A trap that blows out a bridge across a chasm, or bars a door automatically from the other side is just as useful as one that attempts to kill the PCs. These are really great tools to heighten the stakes of a ‘race against the clock’ scenario. The PCs need to accomplish something quickly and setting off a trap has made the task more difficult. One of my favorite implementations for this is greased stairs. An artillery/control monster is perched on a ledge fortified with cover raining down damage on the PCs fighting below. The PCs can move 2 squares a turn without consequence up the stairs to the monster but attempting to go any faster they have to make a difficult Acrobatics check. If the PC fails he goes prone and slides all the way to the bottom of the stairs. Even if the PCs have killed everything else in the room the monster in its fortified perch can hold its own against the full party. This entry was posted in DMs and tagged 4e, D&D, DM, Dragons, Dungeons, RPG, Traps by redraggedfiend. Bookmark the permalink.